`a`ohe mea nana e ho`opilikia. and sleep on the wayside; let them not be molested. The law of the splintered paddle declared that old men and women and children may lie on the roadside and they shall not be molested. A royal edict of Kamehameha the Great, thus began the era of freedom from violent assault. In ancient Hawai‘i, there were no laws as we know them today. The sacred kapu, traditions, respect for one another and love for the land kept order and harmony among men and women long before the haole (foreigners) arrived, bringing their varieties of civilization. It was only with the changing times and contact with Europeans that laws came to be written down. As a tribute to his people, the very first law proclaimed by Kamehameha the Great was a law that protected them all, from the elderly to the very young. There are many stories of how this law came about. One tells of a commoner who taught Kamehameha that human life — any human life — was precious and deserved respect, and that it was wrong for the powerful to mistreat those who may be weaker. The teacher was a fisherman. 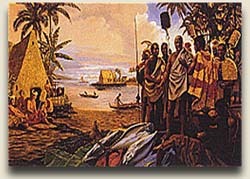 The student was Kamehameha as a warrior before he united the islands. The lesson was not written in a book or on a chalkboard. It was delivered with the whack of a wooden canoe paddle. It was a harsh lesson, but Kamehameha never forgot it, because he later turned that lesson into Hawai‘i’s first official written law.